“Creating High Performance Correction Environments: The ‘X Factor’ for the Next Generation of Prisons” will be featured in the March/April issue of Corrections News. It’s written by Performa and former Warden Bob Hood, a national security expert. The economic stress on corrections professional as they’re expected to do more with less. Creating high-performance environments by looking beyond bricks and mortar. How Performa views correctional facilities as part of a much larger environment. The overarching tenets that will impact the next generation of prisons. How Performa is working with a team of practitioners to identify and validate the critical issues impacting corrections. Read a sneak peek of the article. Despite much colder weather on Tuesday (30s), and a major winter storm that closed airports across the U.S., traffic was strong on the final day of the ACA Winter Show. The Performa team made many new connections with federal, state and local justice agencies. Plus, Performa’s Next Generation of Prisons garnered a lot of interest and a number of key industry leaders expressed a desire to participate in the initiative. Stay tuned for more updates as the initiative progresses. Congratulations to Patrick Dougherty, Lieutenant with the Houston Police Department, won the Super Bowl Party Package at the ACA Winter Show in San Antonio. On the second day of exhibiting at the ACA Winter Conference in San Antonio, Texas, Performa announced that former Warden and national security specialist Bob Hood has joined Performa’s Advisory Board. Hood has more than 35 years in criminal justice. Performa is excited to have Hood’s experience and insight to support Performa’s rapidly growing Justice practice and the development of the Next Generation of Prisons initiative. 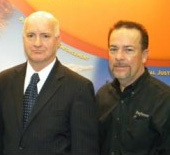 Bob Hood, Hood Security Consulting; and Jeff Kanzelberger, Performa CEO. 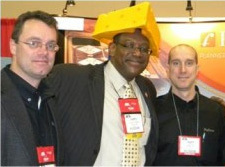 Performa Senior Project Manager Steve Wille, ACA Marketing Darryl Greenridge and Performa Marketing Scott Wohr. 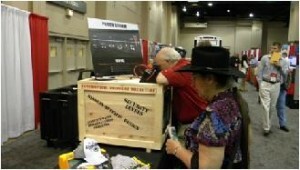 On the first day of exhibiting at the ACA Winter Conference in San Antonio, Texas, many visitors to the Performa booth showed great interest in the Next Generation of Prisons exhibit. The future of prisons and prison reform are top of mind for many corrections professionals. Hans Hansen and Bill Dobyns of Lydig Construction discuss construction trends in the Justice market with Performa’s Steve Wille and Scott Wohr. Visitors to Performa’s booth get an exclusive glimpse at the Next Generation of Prisons. 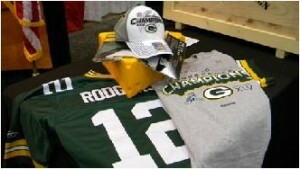 Performa’s Super Bowl package giveaway at the ACA Winter Conference has attracted many Packer and Steeler fans. In the early 70s, there were about 200,000 people locked up in the U.S. Today’s prison population of 1.8 million represents a growth of over 800% in the past 30 years. If recent incarceration rates remain unchanged, an estimated 1 out of every 20 persons (5.1%) will serve time in prison during their lifetime. What can we do to improve prison performance? Performa will offer a video preview of prisons of the future and more details about its “Next Generation of Prisons” initiative at its booth during the American Correctional Association (ACA) Winter Conference. The conference will be held Jan. 28—Feb. 2 at the Henry B. Gonzalez Convention Center in San Antonio,Texas. 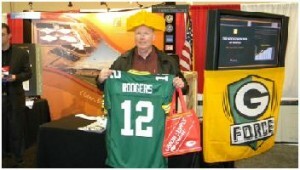 The Exhibit Hall will be open Jan. 30—Feb. 1 and will be the site of a reception from 4 to 6 p.m. Jan. 30. Attending from Performa will be Jeffrey Kanzelberger, CEO; David Robillard, Justice Group President; and Steve Wille, Senior Project Manager. They invite everyone to stop at the Performa booth, see the video, and share thoughts on what future prisons may look like. Noted college football coach Gene Stallings will be the keynote speaker at the ACA Annual Luncheon Feb. 1. Educational opportunities will include Continuing Education Units (CEUs) in partnership with Sam Houston State University. 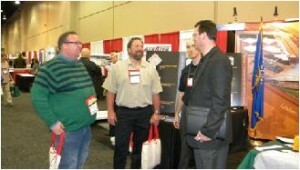 Representatives will be on hand to discuss the latest products and services in the Exhibit Hall. Find out more about the conference and register online. If you don’t want to conduct an audit or analysis, ask the company who is performing your service upgrade to rank the corrective measures and results in order of time to ROI. Begin with the shortest time to ROI and use the money saved to invest in the next corrective measure. The National Institute of Standards and Technology estimates gas savings are greater than 40% and electrical savings are greater than 25% when the air barrier of your building envelope is improved. If your envelope is losing heat or cool air, your HVAC system works hard to replace it, making envelope improvements one of the best measures to get fast ROI. Some measures you can take are caulking and weather stripping cracks, leaks and holes in the envelope. When building new, use a drainage plane like building paper or house wrap. Use a high-mass construction such as precast concrete to regulate internal temperatures or implement a radiant heating and cooling system within the walls or floor. This system combines a building management system and advanced software solutions that work together to control your HVAC system. It will lower your utility costs by adjusting heating and cooling to environmental conditions. Each of our latest blogs has dealt with improving different areas of your facility to save energy. The key take-away: your energy use is building-wide, so every upgrade affects the other. Keep tabs on each system and the energy and money saved. Your next upgrade needs to reflect this change. For example, if you add reflective roofing, the AC output is much lower; therefore, your next AC unit should be much smaller. To get more money-saving tips for your facility, subscribe to this blog. If you want to save energy in your facility, look at your HVAC system. You try to keep every piece of your equipment running until it breaks, so why not do the same with your HVAC system? Don’t think you’re cutting costs by ignoring it; it will actually cost you more in the end. Treat scale build-up with a chemical or non-chemical program. Just make sure that the treatment program can take care of scale, corrosion and microbiological control. If your central plant utilizes boiler and chillers for heating and cooling, consider retrofitting the HVAC mechanical system with pressure independent valves. Savings on utility costs have been shown to be within 35-45% within two years. If you’re building new, have these valves installed right away and enjoy low utility costs from the get-go. Correctional Complex in Norfolk, Virginia, upgraded their system by installing a complex-wide energy management and control system. They also installed steam trap upgrades and replaced two 1,500-horsepower steam plants with the expectation of a positive ROI. California has also done some major overhauling to their corrections facilities because of the governor’s bill that was passed. To see a list of facilities and their energy construction costs and annual savings, go to http://www.cdcr.ca.gov/News/Energy_Savings/docs/EnergyProjectPhase1.pdf. In our next blog, we will talk about things you can do within your building to prevent your HVAC system from consuming massive amounts of energy. 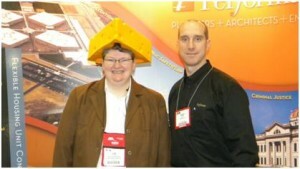 *Some of these tips were taken from our LinkedIn group, BOMA. According to the 2010 ACA Summer Conference Report, in a sample facility with 1,200 beds, if utility prices rise by as little as 5% per year over the next 20 years, costs for the institution could be as high as $1,200,000 or more. This equates to $1,000 per inmate. If the goal of corrections institutions today is reducing costs, how do they go about escaping this escalating expense? In our last post, we focused on how facilities could save on water consumption. This post will focus on reducing energy costs for sustainability. It has been noted that lighting improvements give faster returns on investment than other means. Boulder, Colorado, County Jail and the El Dorado State Correctional Facility in Kansas are now using skylights as a way to harvest daylight. These facilities also replaced T12 fluorescent fixtures with T-8 fixtures, provided LED task lights, and swapped incandescent bulbs with compact fluorescent bulbs. El Dorado State Correctional Facility in Kansas invested $2.1 million in several energy-saving methods, including lighting, and is saving $247,517 per year. The return on investment over 10 years: 12%. Before determining what lighting technology to implement, it is important to do your homework. Understand the costs and benefits of each lighting component. Understand what you gain from each level of technology versus the cost. If you misapply the technology or if it is not installed correctly, users will become dissatisfied. Don’t focus too much on a particular aspect of the project and understand the correct application for individual controls versus system controls. You see this symbol on a range of products. ENERGY STAR appliances meet the strict energy efficiency guidelines set by the US Environmental Protection Agency. You can save up to 25% or more on energy used by replacing appliances like clothes washers, refrigerators, freezers, and water coolers. By requiring inmate TV’s to have this seal of approval and appliances and machinery in prison industry shops, you will use 30-40% less energy. By shutting off vending machines when not in use can alone save up to 50% of the electricity. HMYOI Deerbolt has implemented a lot of initiatives that have helped create a “green” culture within the prison. Site manager Brian Coats says that it has been shown that you can save up to 20% of your energy bills without any investment. One way they have done this is by getting the inmates and staff thinking green. They hold ongoing greening committees that allow inmates to create ideas to reduce energy consumption. There is also an incentive program for inmates who are caught saving energy. Staff trainings include ways staff can save energy in their own homes and show them how much money the facility spends on energy compared to other things like C&R equipment. This has given the staff an incentive to change their energy-consuming habits in order to get things they want. What types of energy-saving tactics has your facility used? We’d love to hear from you. To get more tips on how correctional facilities can save money, follow this blog. For water-saving ideas, see our previous blog. For those in charge of building correctional facilities, you understand the looming budgetary crisis that is at the forefront of every decision made within the facility. There is no doubt that by implementing environmentally friendly practices and technologies within the building design future operational costs will decrease and operators will be able to run their facilities within budget and be able to invest in security and rehabilitative measures. But making a correctional facility more environmentally friendly is a challenging task when taking into account security, regulatory restrictions and the 24-hour occupancy levels and usage needs. One specific problem is water consumption. From showers, laundry, kitchens and landscaping, large amounts of water are consumed within prison facilities. According to Supply Link, the R.J. Donovan Correctional Facility in San Diego, Calif., housing 4,000 inmates and 1,300 support staff, uses over 290 million gallons of water per year. The cost: $1,900,000. Here are some tips on how to minimize consumption. By implementing PC-based water systems, security is able to control individual or group plumbing fixtures in a cell or cells, group showers or individual showers to reduce and manage water usage. Also, using treated, recovered water gathered from rain and air handler condensation for toilet flushing will reduce the consumption of potable water. Due to Calif. Governor’s Arnold Schwarzenegger’s state of emergency declaration on water shortage in 2009, the California Department of Corrections and Rehabilitation (CDCR) implemented flush meters in many of the institutions across the state. The buildings that used them saw an average savings of 27 percent annually. North Carolina’s Butner Federal Prison, the first LEED-certified correctional institution in the United States, uses low-flow plumbing fixtures, like toilets, urinals and shower heads, to save on water consumption. San Mateo County in California has reduced their water consumption by as much as 20 percent by installing these efficient plumbing fixtures. If the facility is located in a hot, dry climate, reduce outdoor watering by planting drought-tolerant native plants. Construct the recreation field out of synthetic grass and/or recycled tires. Harvest water by using a rain barrel, which collects and stores rain water runoff from roofs or gutters in order to water outside greenery. Or insert a swale like The Women’s Garden Project created for Evergreen Corrections Center in British Columbia, Canada. Swales are shallow, low depressions in the ground, lined with trees. They collect stormwater, infiltrating the surrounding soil and cleansing the water as it becomes absorbed. To learn more about these water-saving methods, view an article by Corrections.com. If you have more to say on this topic, create a comment below; we’d like to hear from you.